Here, as in many chapters of Tehillim, David appeals to God for protection against men of deceit and treachery, those who fiendishly scheme against him in the hope of ruining him. He bases his appeal on God's contempt for dishonest and fraudulent conduct; verses 5-7 describe God's "hatred" and utter rejection of those who lie, cheat and conspire against others. Such people, David affirms, are not welcome near the Almighty: "For You are not a God who desires wickedness; evil shall not reside with You." David, by contrast, through his honest and upright behavior, is warmly welcomed by God; he is invited to "come into Your home" and "bow to Your holy sanctuary" (verse 8). On this basis, David petitions God to accept his prayers and rescue him from his devious adversaries. In verse 9, we are given a glimpse into the kind of deceit and corruption to which David was subject. He begs the Almighty to guide him along the proper path "because of those who look askance at me" ("Le'ma'an Shorerai"). As Rashi explains, David's adversaries scrutinized his every move in anticipation of the moment when he would take a wrong step and stumble upon a misdeed, on which they could capitalize to deny his claims to the moral high-ground. With cruel, shameless animosity, they would magnify each and every one of David's blunders in an attempt to cast him as the villain and themselves as the innocent victims. He therefore pleads to God to lead him along the righteous path and save him from wrong turns which would lead him straight into the trap of his conspiring antagonists. 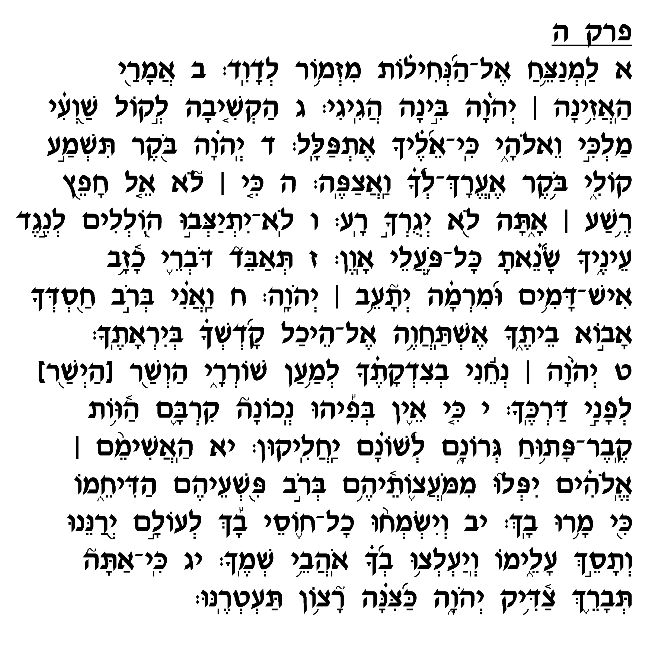 David concludes this prayer by reassuring himself of the divine blessing and protection earned by the Tzadik. The corrupt machinations of his foes cannot penetrate the "shield" ("Tzina," verse 13) with which the Almighty protects those whom He loves. In summary, then, this Psalm emphasizes the futility of deceit and dishonesty as means of achieving one's goals. God despises such behavior, and can thus be guaranteed to intercede to foil insidious plots against innocent victims, and visit harsh retribution upon the perpetrators of this form of evil.